Fashioned from an old tree, this set includes two log benches and table. Oh … and teeny bunny hides underneath. 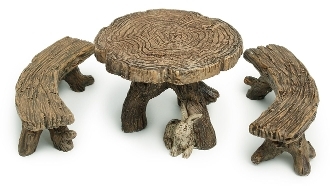 Log Table and Chairs for Miniature Fairy Gardens.